At NERR we can quickly and accurately gain access to a specific document stored within your files, or have a document added to a file stored in our Record Center. Should you ever need them, your files can be retrieved and delivered very quickly to your facility. Our service relieves your company of the space and personnel requirements associated with managing and tracking boxes of information. Here at NERR we like to think of ourselves as an extension of your office or filing room. We use the O’Neil Software Inventory System that with barcodes: locates, tracks and organizes all your critical information. What can NERR do for you? Our storage facility can accommodate any size business. You use valuable human resources and costly office space to store and manage your clients’ records. 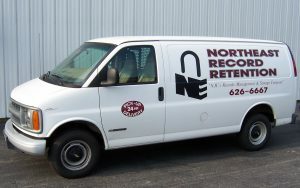 By storing those confidential records with NERR, we can help you reduce your cost; which allows your office to be more efficient. Our professional couriers pick up and deliver your records in climate controlled, secure vehicles. When you need to retrieve your information, it’s easily accessible. We have the ability to search for certain documents to improve access. Our indexing service allows us to electronically search for documents using keywords such as client’s name or number. Our barcode system does a great job tracking all boxes and/or documents. We know how long to keep records to limit your records growth. We can help set up retention schedules so records are not kept any longer than need be.